The impacts of climate change and human activities on oasis water requirements in Heihe River basin were quantified with the methods of partial derivative and slope in this study. The results showed that the oasis water requirement increased sharply from 10.8 × 108 to 19.0 × 108 m3 during 1986–2013. Human activities were the dominant driving forces. Changes in climate, land scale and structure contributed to the increase in water requirement at rates of 6.9, 58.1, and 25.3 %, respectively. Land-use change is still overly simplistically implemented in global ecosystem and climate models. We identify and discuss three major challenges at the interface of land-use and climate modeling and propose ways for how to improve land-use representation in climate models. We conclude that land-use data-provider and user communities need to engage in the joint development and evaluation of enhanced land-use datasets to improve the quantification of land use–climate interactions and feedback. We evaluate the effects of land-use and land-cover changes on carbon pools and fluxes using a dynamic global vegetation model. Different historical reconstructions yielded an uncertainty of ca. 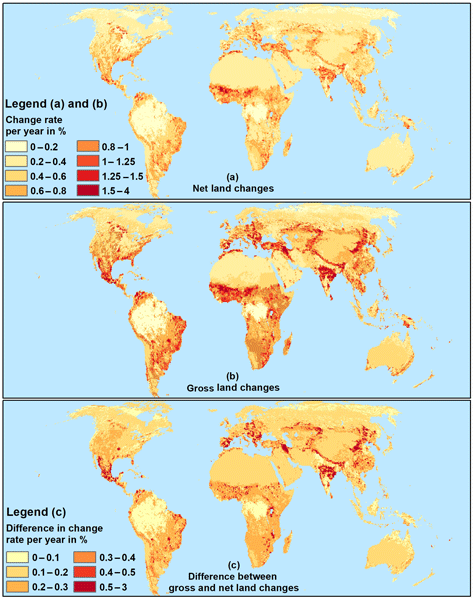 ±30 % in the mean annual land use emission over the last decades. Accounting for the parallel expansion and abandonment of croplands on a sub-grid level (tropical shifting cultivation) substantially increased the effect of land use on carbon stocks and fluxes compared to only accounting for net effects. The transition of land from one cover type to another can adversely affect the Earth system. A growing body of research aims to map these transitions in space and time to better understand the impacts. Here we develop a statistical model that is parameterized by socio-ecological geospatial data and extensive aerial/ground surveys to visualize and interpret these transitions on an annual basis for 30 years in Kenya. Future work will use this method to project land suitability across Africa. This research is about climate change adaptation. It demonstrates how adaptation to climate change can avoid social tensions if done in a sustainable way. Evidence is drawn from Malawi in southern Africa. The development of global cropland in the future depends on how many people there will be, how much meat and milk we will eat, how much food we will waste and how well farms will be managed. Uncertainties in these factors mean that global cropland could decrease from today's 1500 Mha to only 893 Mha in 2100, which would free land for biofuel production. However, if population rises towards 12 billion and global yields remain low, global cropland could also increase up to 2380 Mha in 2100. We simulated effects of irrigation on climate with the NASA GISS global climate model. Present-day irrigation levels affected air pressures and temperatures even in non-irrigated land and ocean areas. The simulated effect was bigger and more widespread when ocean temperatures in the climate model could change, rather than being fixed. We suggest that expanding irrigation may affect global climate more than previously believed. We used a vegetation model to study the legacy effects of different land-use histories on ecosystem recovery in a range of environmental conditions. We found that recovery trajectories are crucially influenced by type and duration of former agricultural land use, especially for soil carbon. Spatially, we found the greatest sensitivity to land-use history in boreal forests and subtropical grasslands. These results are relevant for measurements, climate modeling and afforestation projects. Climate change complicates rural conflict resolution dynamics and institutions. There is urgent need for conflict-sensitive adaptation in Africa. The study of social network data reveals three forms of fused conflict resolution arrangements in Loitoktok, Kenya. Where, extension officers, council of elders, local chiefs and private investors are potential conduits of knowledge. Efficiency of rural conflict resolution can be enhanced by diversification in conflict resolution actors and networks. According to groundwater flow and mass transport simulations, nitrate concentration for year 2050 would increase mainly due to the attainment of equilibrium conditions of the aquifer system related to actual nitrogen loadings, and to the increase in nitrogen loadings due to changes in agricultural practices. Impact of climate change on the groundwater recharge would contribute only slightly to that increase. The impact of deforestation is to warm the tropics and cool the extratropics, and the magnitude of the impact depends on the spatial extent and the degree of forest loss. That also means location matters for the impact of deforestation on temperature because such an impact is largely determined by the climate condition of that region. For example, under dry and wet conditions, deforestation can have quite different climate impacts. A prototype model LandPro was developed to study climate change impact on land use in West Africa. LandPro considers climate and socioeconomic factors in projecting anthropogenic future land use change (LULCC). The model projections reflect that relative impact of climate change on LULCC in West Africa is region dependent. Results from scenario analysis suggest that science-informed decision-making by the farmers in agricultural land use can potentially reduce crop area expansion in the region. A major link between climate and humans in northern Africa, and the Sahel in particular, is land use. We assess possible feedbacks between the type of land use and harvest intensity and climate by analysing a series of idealized GCM experiments using the MPI-ESM. Our study suggests marginal feedback between land use changes and climate changes triggered by strong greenhouse gas emissions. Estimates for land use change CO2 emissions (eLUC) rely on different approaches, implying conceptual differences of what eLUC represents. We use an Earth System Model and quantify differences between two commonly applied methods to be ~20% for historical eLUC but increasing under a future scenario. We decompose eLUC into component fluxes, quantify them, and discuss best practices for global carbon budget accountings and model-data intercomparisons relying on different methods to estimate eLUC. This study concludes that integrated analysis of course and fine-scale, inter-annual and intra-annual trends enables a more robust identification of changes in vegetation condition. Seasonal trend analysis was found to be very useful in identifying changes in vegetation condition that could be masked if only inter-annual vegetation trend analysis were performed. The finer-scale intra-annual trend analysis revealed trends that were more linked to human activities. The radiative forcing of land use and land cover change activities has recently been computed for a set of forcing agents including long-lived greenhouse gases, short-lived agents (ozone and aerosols), and land surface albedo change. Here we address where the global forcing comes from and what land use activities, such as deforestation or agriculture, contribute the most forcing. We find that changes in forest and crop area can be used to predict the land use radiative forcing in some regions. A theoretical framework for the net land-to-atmosphere CO2 flux and its implications in the definition of "emissions from land-use change"
Alexander, L. V., Zhang, X., Peterson, T. C., Caesar, J., Gleason, B., Klein Tank, A. M. G., Haylock, M., Collins, D., Trewin, B., Rahimzadeh, F., Tagipour, A., Rupa Kumar, K., Revadekar, J., Griffiths, G., Vincent, L., Stephenson, D. B., Burn, J., Aguilar, E., Brunet, M., Taylor, M., New, M., Zhai, P., Rusticucci, M., and Vazquez-Aguirre, J. L.: Global observed changes in daily climate extremes of temperature and precipitation, J. Geophys. Res., 111, D05109, https://doi.org/10.1029/2005jd006290, 2006. Arnfield, A. J.: Two decades of urban climate research: A review of turbulence, exchanges of energy and water, and the urban heat island, Int. J. Climatol., 23, 1–26, 2003. Avila, F. B., Pitman, A. J., Donat, M. G., Alexander, L. V., and Abramowitz, G.: Climate model simulated changes in temperature extremes due to land cover change, J. Geophys. Res., 117, D04108, https://doi.org/10.1029/2011jd016382, 2012. Bala, G., Caldeira, K., Wickett, M., Phillips, T. J., Lobell, D. B., Delire, C., and Mirin, A.: Combined climate and carbon-cycle effects of large-scale deforestation, Proc. Natl. Acad. Sci., 104, 6550–6555, https://doi.org/10.1073/pnas.0608998104, 2007. Boisier, J.-P., de Noblet-Ducoudré, N., Pitman, A. J., Cruz, F., Delire, C., van den Hurk, B. J. J. M., van der Molen, M. K., Müller, C., and Voldoire, A.: Attributing the biogeophysical impacts of Land-Use induced Land-Cover Changes on surface climate to specific causes. Results from the first LUCID set of simulations, J. Geophys. Res., 117, D12116, https://doi.org/10.1029/2011JD017106, 2012. Caesar, J., Alexander, L., and Vose, R.: Large-scale changes in observed daily maximum and minimum temperatures: Creation and analysis of a new gridded data set, J. Geophys. Res., 111, D05101, https://doi.org/10.1029/2005jd006280, 2006. Chang, H.-I., Niyogi, D., Kumar, A., Kishtawal, C. M., Dudhia, J., Chen, F., Mohanty, U. C., and Shepherd, M.: Possible relation between land surface feedback and the post-landfall structure of monsoon depressions, Geophys. Res. Lett., 36, L15826, https://doi.org/10.1029/2009gl037781, 2009. DeAngelis, A., Dominguez, F., Fan, Y., Robock, A., Kustu, M. D., and Robinson, D.: Evidence of enhanced precipitation due to irrigation over the Great Plains of the United States, J. Geophys. Res., 115, D15115, https://doi.org/10.1029/2010JD013892, 2010.
de Noblet-Ducoudré, N., Boisier, J.-P., Pitman, A., Bonan, G. B., Brovkin, V., Cruz, F., Delire, C., Gayler, V., van den Hurk, B. J. J. M., Lawrence, P. J., van der Molen, M. K., Müller, C., Reick, C. H., Strengers, B. J., and Voldoire, A.: Determining robust impacts of land-use induced land-cover changes on surface climate over North America and Eurasia; Results from the first set of LUCID experiments, J. Climate, 25, 3261–3281, https://doi.org/10.1175/jcli-d-11-00338.1, 2012. Deo, R. C., Syktus, J. I., McAlpine, C. A., Lawrence, P. J., McGowan, H. A., and Phinn, S. R.: Impact of historical land cover change on daily indices of climate extremes including droughts in eastern Australia, Geophys. Res. Lett., 36, L08705, https://doi.org/10.1029/2009GL037666, 2009. Douglas, E. M., Beltrán-Przekurat, A., Niyogi, D., Pielke Sr., R. A., Vörösmarty, C. J.: The impact of agricultural intensification and irrigation on land-atmosphere interactions and Indian monsoon precipitation – A mesoscale modeling perspective, Global Planet. Change, 67, 117–128, https://doi.org/10.1016/j.gloplacha.2008.12.007, 2009. Feddema, J. J., Oleson, K. W., Bonan, G. B., Mearns, L. O., Buja, L. E., Meehl, G. A., and Washington, W. M.: The Importance of land-cover change in simulating future climates, Science, 310, 1674–1678, https://doi.org/10.1126/science.1118160, 2005. Findell, K. L., Pitman, A. J., England, M. H., and Pegion, P. J.: Regional and Global Impacts of Land Cover Change and Sea Surface Temperature Anomalies, J. Climate, 22, 3248–3269, 2009. Forster, P., Ramaswamy, V., Artaxo, P., Berntsen, T., Betts, R., Fahey, D. W., Haywood, J., Lean, J. L., Lowe, D. C., Myhre, G., Nganga, J., Prinn, R., Raga, G., Schulz, M., and Van Dorland, R.: Changes in atmospheric Cconstituents and in radiative forcing, in: Climate Change 2007: The Physical Science Basis. Contribution of Working Group I to the Fourth Assessment Report of the Intergovernmental Panel on Climate Change, edited by: Solomon, S., Qin, D., Manning, M., Chen, Z., Marquis, M., Averyt, K. B., Tignor, M., and Miller, H. L., CUP, Cambridge, UK and New York, NY, USA, 2007. Gero, A. F. and Pitman, A. J.: The Impact of Land Cover Change on a Simulated Storm Event in the Sydney Basin, J. Appl. Meteorol. Climatol., 45, 283–300, https://doi.org/10.1175/JAM2337.1, 2006. Goldewijk, K. K.: Estimating global land use change over the past 300 years: The HYDE Database, Global Biogeochem. Cy., 15, 417–433, https://doi.org/10.1029/1999gb001232, 2001. Hazeleger, W., Wang, X., Severijns, C., Ştefănescu, S., Bintanja, R., Sterl, A., Wyser, K., Semmler, T., Yang, S., van den Hurk, B., van Noije, T., van der Linden, E., and van der Wiel, K.: EC-Earth V2.2: description and validation of a new seamless earth system prediction model, Clim. Dynam., 1–19, https://doi.org/10.1007/s00382-011-1228-5, 2011. IPCC: Summary for Policymakers, in: Managing the Risks of Extreme Events and Disasters to Advance Climate Change Adaptation. A Special Report of Working Groups I and II of the Intergovernmental Panel on Climate Change, edited by: Field, C. B., Barros, V., Stocker, T. F., Qin, D., Dokken, D. J., Ebi, K. L., Mastrandrea, M. D., Mach, K. J., Plattner, G.-K., Allen, S. K., Tignor, M., and Midgley, P. M., CUP, Cambridge, UK, and New York, NY, USA, 1–19, 2012. Klein Tank, A. M. G. and Zwiers, F. W.: Guidelines on Analysis of extremes in a changing climate in support of informed decisions for adaptation World Meteorological Organization, Geneva, Switzerland, 56, 2009. Krinner, G., Viovy, N., de Noblet-Ducoudré, N., Ogeé, J., Polcher, J., Friedlingstein, P., Ciais, P., Sitch, S., and Prentice, I. C.: A dynamic global vegetation model for studies of the coupled atmosphere-biosphere system, Global Biogeochem. Cy., 19, GB1015, https://doi.org/10.1029/2003gb002199, 2005. Lawrence, P. J. and Chase, T. N.: Investigating the climate impacts of global land cover change in the community climate system model, Int. J. Climatol., 30, 2066–2087, https://doi.org/10.1002/joc.2061, 2010. Levis, S.: Modeling vegetation and land use in models of the Earth System, WIRES: Climate Change, 1, 840–856, https://doi.org/10.1002/wcc.83, 2010. Marti, O., Braconnot, P., Dufresne, J. L., Bellier, J., Benshila, R., Bony, S., Brockmann, P., Cadule, P., Caubel, A., Codron, F., de Noblet, N., Denvil, S., Fairhead, L., Fichefet, T., Foujols, M. A., Friedlingstein, P., Goosse, H., Grandpeix, J. Y., Guilyardi, E., Hourdin, F., Idelkadi, A., Kageyama, M., Krinner, G., Lévy, C., Madec, G., Mignot, J., Musat, I., Swingedouw, D., and Talandier, C.: Key features of the IPSL ocean atmosphere model and its sensitivity to atmospheric resolution, Clim. Dynam., 34, 1–26, https://doi.org/10.1007/s00382-009-0640-6, 2010. Niyogi, D., Pyle, P., Lei, M., Arya, S. P., Kishtawal, C. M., Shepherd, M., Chen, F., and Wolfe, B.: Urban Modification of Thunderstorms: An Observational Storm Climatology and Model Case Study for the Indianapolis Urban Region, J. Appl. Meteorol. Climatol., 50, 1129–1144, https://doi.org/10.1175/2010jamc1836.1, 2011. Pielke, R. A., Sr.: Influence of the spatial distribution of vegetation and soils on the prediction of cumulus convective rainfall, Rev. Geophys., 39, 151–177, https://doi.org/10.1029/1999rg000072, 2001. Pielke, R. A., Sr., Pitman, A., Niyogi, D., Mahmood, R., McAlpine, C., Hossain, F., Goldewijk, K. K., Nair, U., Betts, R., Fall, S., Reichstein, M., Kabat, P., and de Noblet, N.: Land use/land cover changes and climate: modeling analysis and observational evidence, WIRES: Climate Change, 2, 828–850, https://doi.org/10.1002/wcc.144, 2011. Pitman, A. J.: The evolution of, and revolution in, land surface schemes designed for climate models, Int. J. Climatol., 23, 479–510, 2003. Pitman, A. J., de Noblet-Ducoudré, N., Cruz, F. T., Davin, E. L., Bonan, G. B., Brovkin, V., Claussen, M., Delire, C., Ganzeveld, L., Gayler, V., van den Hurk, B. J. J. M., Lawrence, P. J., van der Molen, M. K., Müller, C., Reick, C. H., Seneviratne, S. I., Strengers, B. J., and Voldoire, A.: Uncertainties in climate responses to past land cover change: First results from the LUCID intercomparison study, Geophys. Res. Lett., 36, L14814, https://doi.org/10.1029/2009gl039076, 2009. Pitman, A. J., Avila, F. B., Abramowitz, G., Wang, Y. P., Phipps, S. J. ,and de Noblet-Ducoudré, N.: Importance of background climate in determining impact of land-cover change on regional climate, Nature Clim. Change, 1, 472–475, 2011. 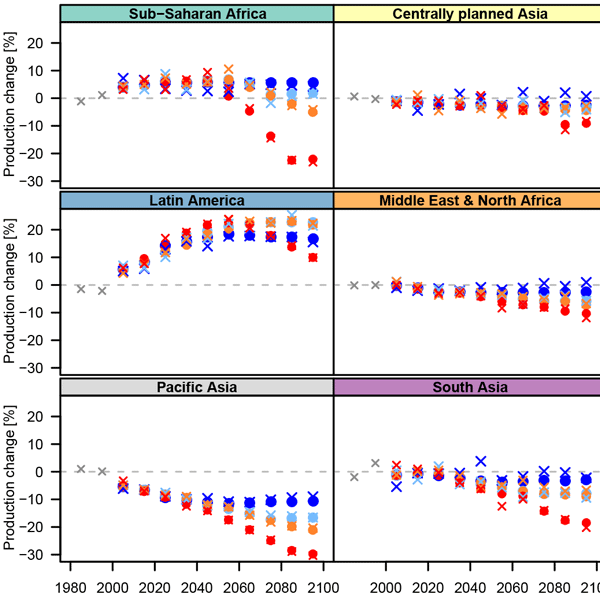 Puma, M. J. and Cook, B. I.: Effects of irrigation on global climate during the 20th century, J. Geophys. Res., 115, D16120, https://doi.org/10.1029/2010JD014122, 2010. Raddatz, T., Reick, C., Knorr, W., Kattge, J., Roeckner, E., Schnur, R., Schnitzler, K. G., Wetzel, P., and Jungclaus, J.: Will the tropical land biosphere dominate the climate-carbon cycle feedback during the twenty-first century?, Clim. Dynam., 29, 565–574, https://doi.org/10.1007/s00382-007-0247-8, 2007. Salas-Mélia, D., Chauvin, F., Déqué, M., Douville, H., Guérémy, J. F., Marquet, P., Planton, S., Royer, J. F., and Tyteca, S.: Description and validation of the CNRM-CM3 global coupled climate model, CNRM working note 103, available at: http://www.cnrm.meteo.fr/scenario2004/paper_cm3.pdf, 2005. Seneviratne, S. I., Luthi, D., Litschi, M., and Schar, C.: Land-atmosphere coupling and climate change in Europe, Nature, 443, 205–209, 2006. Shepherd, J. M.: A review of current investigations of urban-induced rainfall and recommendations for the future, Earth Interact., 9, paper 12, 1–27, 2005. Stefanon, M., Drobinski, P., D'Andrea, F., and de Noblet-Ducoudré, N.: Effects of interactive vegetation phenology on the 2003 summer heat waves, J. Geophys. Res., in press, https://doi.org/10.1029/2012JD018187, 2012. Teuling, A. J., Seneviratne, S. I., Stockli, R., Reichstein, M., Moors, E., Ciais, P., Luyssaert, S., van den Hurk, B., Ammann, C., Bernhofer, C., Dellwik, E., Gianelle, D., Gielen, B., Grunwald, T., Klumpp, K., Montagnani, L., Moureaux, C., Sottocornola, M., and Wohlfahrt, G.: Contrasting response of European forest and grassland energy exchange to heatwaves, Nat. Geosci., 3, 722–727, 2010.
van der Molen, M. K., van den Hurk, B. J., and Hazeleger, W.: A dampened land use change climate response towards the tropics, Clim. Dynam., 37, 2035–2043, https://doi.org/10.1007/s00382-011-1018-0, 2011. Voldoire, A.: Quantifying the impact of future land-use changes against increases in GHG concentrations, Geophys. Res. Lett., 33, L04701, https://doi.org/10.1029/2005gl024354, 2006. Zhang, X., Alexander, L., Hegerl, G. C., Jones, P., Tank, A. K., Peterson, T. C., Trewin, B., and Zwiers, F. W.: Indices for monitoring changes in extremes based on daily temperature and precipitation data, WIRES: Climate Change, 2, 851–870, https://doi.org/10.1002/wcc.147, 2011. Zhao, M. and Pitman, A. J.: The impact of land cover change and increasing carbon dioxide on the extreme and frequency of maximum temperature and convective precipitation, Geophys. Res. Lett., 29, 1078, https://doi.org/10.1029/2001gl013476, 2002.